Geoffrey Nunberg - on "small-d democrats"
Political language is a matter of artful reinterpretation -- neutralizing and blurring the words your opponents have used against you, and making slogans out of the ones that everyone takes for granted. The word democrat has undergone both processes in its time: the first a century ago, the second in recent years. The new cycle was signalled in President Bush's remarks last week on the recent Palestinian elections and the Iraqi elections on Jan. 30: "As a democrat, as a person who believes in democracy -- a Republican democrat, I might add -- as someone who believes that everybody has a right to live in a free society. . . January, 2005, is an extraordinary month." That's pretty much the reason why Americans rarely bother to describe themselves as small-d democrats in the political sense of the word, to mean someone who advocates democracy -- it's supposed to go without saying. But until the 20th century democrat was a charged term in American political life. In the age of Jefferson and Jackson, Americans were still aware that the word had been borrowed from French at the time of the French Revolution, when democrat was opposed to aristocrat, and the idea of "rule of the people" could evoke the alarming echoes of tumbrils in the streets. And the name of the Democratic Party itself (or the "Democratic Republicans" as they were called in Jefferson's time) was derived from the clubs called "democratic societies," which were modeled after Jacobin groups of Revolutionary France. It wasn't until the 20th century that democracy began to recede into the American rhetorical wallpaper, stripped of most of its connotations of social and economic equality -- this even as "the people" was starting to sound a little musty as a name for the common man. 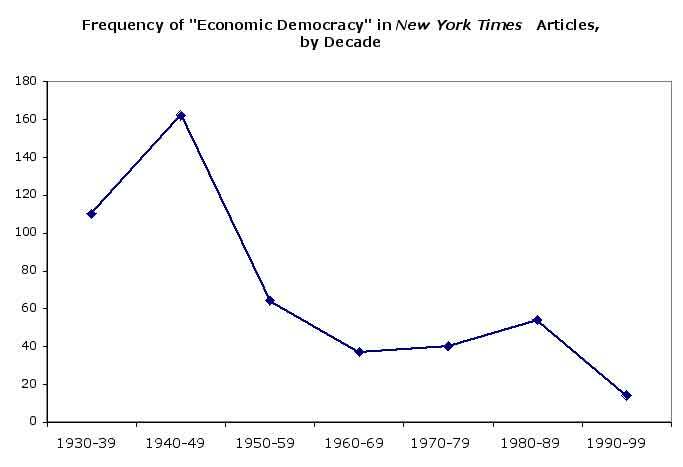 In fact nowadays the phrase "economic democracy" is only a tenth as common in the press as it was in the Roosevelt years, and almost wholly absent from political discourse, where it calls up phrases like "income redistribution" and "class warfare." Once democracy was safely disconnected from its more radical egalitarian implications, it no longer conjured up the specters of mob rule and despotism that made writers like Kant and Burke so wary the word. Democracy is simply a symbol that creates a sense of unity without connoting much of anything specific -- one of those words Walter Lippman described as "assembl[ing] emotions after they have been detached from their ideas." The bleaching of democracy made small-d democrat irrelevant as a political label -- when an idea is universally accepted, you don't need a name for its adherents. The big-D sense of Democrat persisted, of course, but only as the name of a political affiliation that had no more independent meaning than old party names like Whig and Tory. That's what allowed the Republicans of Hoover's era to start referring to their opponents as the Democrat Party. The point of the maneuver was to suggest that there was nothing particularly democratic about a party whose support was based in urban political machines. But Republicans couldn't have gotten away with it if the earlier meaning of democrat hadn't already faded from the public mind. By mid-century, "Democrat Party" had become the routine tic that it is for modern Republicans, though nowadays it probably has less to do with undermining the Democrats than simply irritating them. Bush uses the phrase in campaign speeches, though he'd doubtless stay away from it in a State of the Union address. In fact "Democrat Party" is such an obvious partisan jab that I'm always a little surprised when I hear Bill O'Reilly and Sean Hannity using it on Fox News -- I'd have figured they'd be more circumspect about tipping their hands. But now it's as if Bush himself is trying to redefine the phrase "democrat party" in a more meaningful way, as a name for his own political affiliation -- Republican democrats, as he puts it. What he actually means to suggest is that the true democrats are the ones who see the elections in Iraq as justifying the administration's policies. Of course some might argue that Bush is using democrat in a rather selective way, particularly in light of the other regimes that the administration has supported (or in some cases, like Venezuela, opposed). Democracy may be on the march, but it seems to have a pretty restricted parade route. But there's this to be said for the way Bush uses small-d democrat -- it pulls democracy itself down off the mantlepiece and puts it back on the table for chewing over. Once a word becomes a partisan rallying cry, it can't continue to function as a object of uncritical universal veneration. It's as the 19th-century historian Walter Bagehot said about the notion of royalty -- once you begin to poke about it you can't reverence it anymore. Copyright Â© 2004 Geoffrey Nunberg All rights reserved.